Echoing a rain cloud with droplets, Emilie Shapiro's handcrafted pendant was inspired by the good that follows a difficult time. 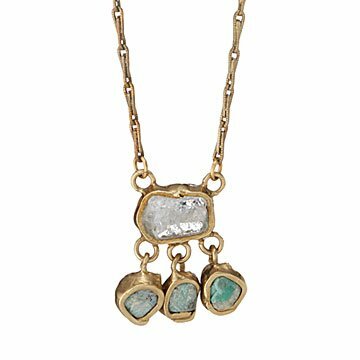 Each piece is created from rose quartz, emeralds, and recycled brass, with the stones left mostly in their rough state. It's both a reminder that beauty exists in life's jagged edges, and a stunning work of wearable art. 18-inch brass chain. Each piece will vary slightly due to the uniqueness of the stones. Handmade in New York City. Make it a set! Click here to see the matching After the Rain Earrings. Truly a unique piece... the chain is spectacular, and that's a bonus! This necklace can be worn forward and backwards, and the length is adjustable. It's like nothing I've ever seen. May be my favorite piece of jewelry!